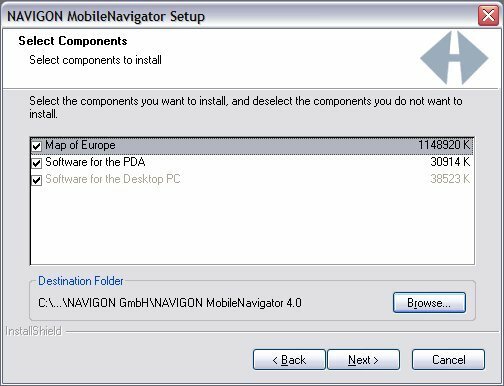 Navigon is an emerging name across Europe and Navigon's main office is situated in Würzburg, Germany. 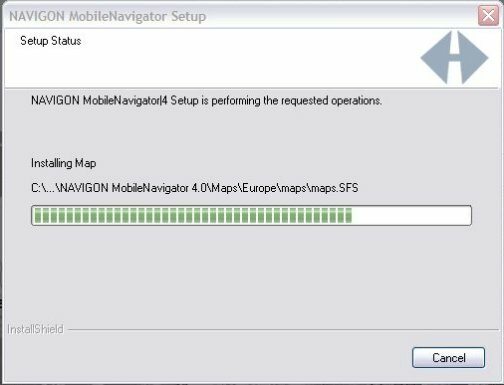 Recently Navigon have released European maps, started selling older versions with the Medion's packaged deal at Aldi Supermarkets and Halfords in the UK, and now Navigon have brought out version 4 of their Mobile Navigator which we will review here. Navigon have taken a slightly different approach to marketing, Navigon MobileNavigator has always been pitched more at the business user, the kind of road warrior compared to the consumer who wants it more for recreational driving. Due to the amount of configurations I'm not going to go into detail with the In The Box section in this review. 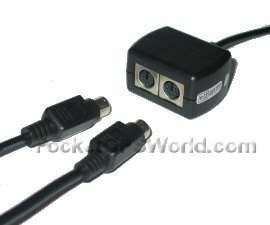 If you go with the GPS Mouse option with software you will receive a windscreen suction mount and all necessary cables to not only power the GPS but also charge your Pocket PC. 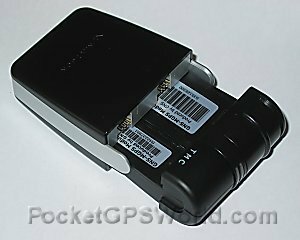 Navigon have created a GPS Receiver with a modular design. Although it is a little oversized compared to most on the market today, it gives you the customer, options in the future. 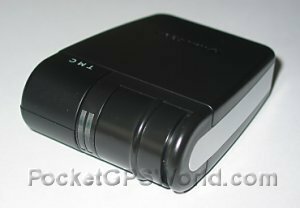 If you just buy the basic GPS Receiver now, you should be able to purchase a plug-in module in the future to add Bluetooth or TMC, so it gives great scope for upgrade which is something you do not see in any other GPS Receiver! There are two types of modules. The first as you will see below are on the left, the second on the right. 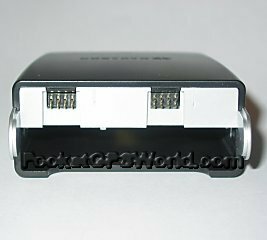 The first module is the standard GPS Mouse Module. This does nothing other than allow you to receive a GPS signal. The second module is identical to the first but it gives you Bluetooth support. The third module again is the basic module that most of you will receive. The fourth module is the TMC module that allows you to receive TMC signals via FM Radio (it has a built in FM tuner). These modules then plug into the GPS Mouse that will sit on your dashboard. 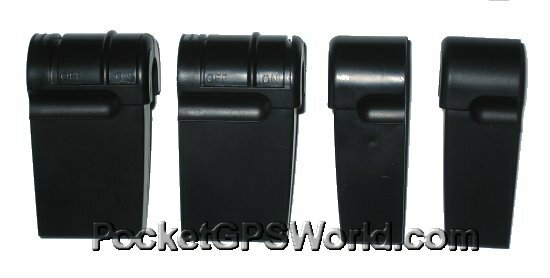 The difference with the mouse casing compared to most GPS Receivers is that it does not have a magnetic base, and therefore is obviously not designed to be placed on a car roof because it is not waterproof. The modules that are shown in the photos above slot into the front part of the GPS Mouse and clip-in to the circuit board (see below). 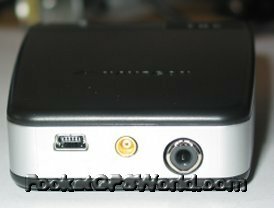 I like this design because it gives scope for upgrade and allows you to truly plug and play. On the back of the GPS Receiver there's a mini-USB plug on the left (above right). This is both for the power and data communication. The middle socket is an MCX antenna socket for an external antenna (optional), and the third socket is the TMC Antenna socket (which will come standard no matter which module design you purchase. The cable design is quite impressive. If you look at the left hand photo below, the cable coming out of the right hand side of the junction box goes straight to the cigarette lighter plug which gives the GPS the power. On the left hand side of the junction box are two sockets PS/2 style in design. One cable goes straight out to plug into the mini-USB socket on the GPS Mouse. The other cable is the PDA cable that plugs in and gives you the power to your PDA and the data connection to the GPS. Unfortunately to keep this to a modular design, once you add the TMC module and TMC Antenna, it does mean you have a nice clutter of cables hanging off the dashboard that you need to try and conceal. 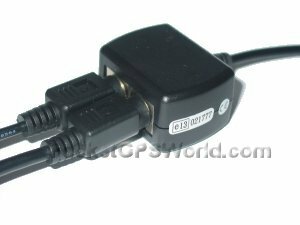 However, if you do go for the Bluetooth module, in theory there's no need to have the power/data cable so you can do away with one of these and just use a standard PDA charger cable from cigarette lighter plug to PDA. This will then require you to have two cigarette lighter sockets in-car if you are going to do it this way. I love the modular design which is ingenious, but the amount of cables does concern me. PC installation of the software is required and that means transferring the complete Western european 7 CD set to your PC. This eats up a lot of space and in all is unnecessary but happens under the standard installation. 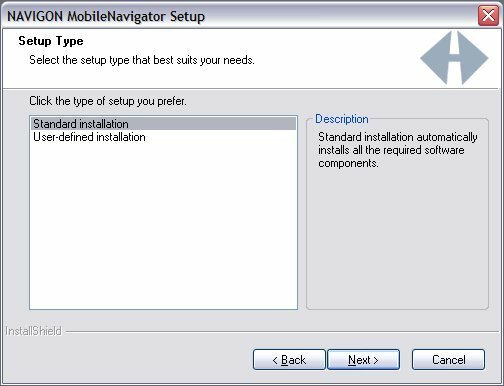 I had a problem that after getting part way through the install, Navigon (or Windows) decided to get confused which CD was which, and after trying to re-insert the CD a number of times, managed to jump start it by placing each CD into the CD tray one by one until it suddenly worked out which CD it required.